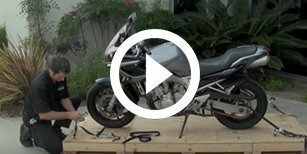 The Cycle Skid is a motorcycle-specific platform that safely secures a bike during transport. Great for Do-it-yourself movers, moving companies, touring companies, exporters, barge operators and trade show vendors. 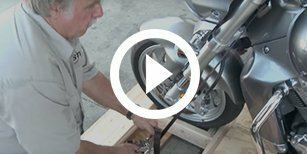 It can be shipped, assembled and stored easily with a significant cost savings over traditional motorcycle crates. Simple slip-fit design lets you skid a bike in minutes. Free shipping in Contiguous United States. Cycle Skid production runs are running behind schedule, we are currently sold out but are expecting more to be available soon. Please email us and we will contact you when they are back in stock. Soft Cinch® straps: One-piece design for simple storage and use. The built-in, self-tightening loop allows you to access strategic attachment points to help reduce damage. This is an exclusive design to help keep your valuable bike safe. Transport with confidence. Transit Cover: Dust cover helps protect your bike during transport. Made from water resistant and breathable non-scratch material. Easily adjusts to fit multiple sizes of bikes. International Plant Protection Commission (IPPC) approved for Export. Heat treated wood construction meets the requirements of the APHIS and ALSC Program to show that the packaging complies with the European and China Union measures. Construction is certified by the West Coast Lumber Inspection Bureau (WCLIB), which is accredited by the American Lumber Standard Committee, Inc. (ALSC). This warranty covers defects in material and workmanship found in the product under normal use and service when the product has been properly used. Motorcycle Shippers will replace, at its discretion, any product that becomes defective within 1 year from the date of purchase. Motorcycle Shippers does not warrant deterioration to the product caused by wear and tear or misuse. Motorcylce Shippers will not be responsible for any costs involved with the shipping of the original product or replacement product.